There are few times in our lives when influencers can unite together and provide honest and truthful opinions on cutting edge health therapies. In today's age, knowledge is power. This is how advancements are made and information is gathered so everyone can experience and learn new techniques and options. Ozone Without Borders has a mission: To bring people together and provide an equal opportunity, whether you are a physician or someone looking to learn about ozone and related therapies. 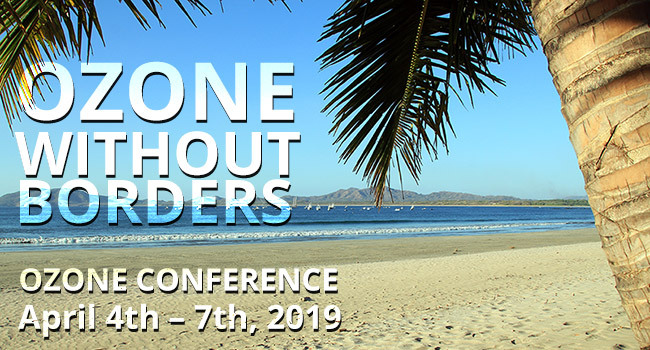 With this in mind, Ozone Without Borders is excited to announceTamarindo, Costa Rica will be hosting this incredible event, from April 4th to April 7th, 2019. Tamarindo is located on the Nicoya Peninsula, which is home to the Costa Rica blue zone. Blue zones are an area where the healthiest, longest living people on earth reside. This is an amazing venue that incorporates knowledge and health in one of the healthiest places on earth. Come to Ozone Without Borders Costa Rica and continue your journey of health and wellness. Dr. Robert Rowen will go over the techniques used in his practice that have made him a leading force in the field. Dr. Howard Robbins will be talking about Lyme disease and HSV I & II treatment options. Prof. Lamberto Re will be talking about the systemic medicine approach to ozone therapy. Prof. Eugeny Nazarov will be talking about the newest and most advanced uses of ozone in the medical field. Prof. Nazarov will be teaching about ozonated saline, hydrogen, and Xenon. $850 per course. Dr. Juan Carlos Perez Olmedo will be teaching about IPO3 or Intraperitoneal Ozone Insufflations. $850 per course. If you have any questions, visit the link above to contact Ozone Without Borders.